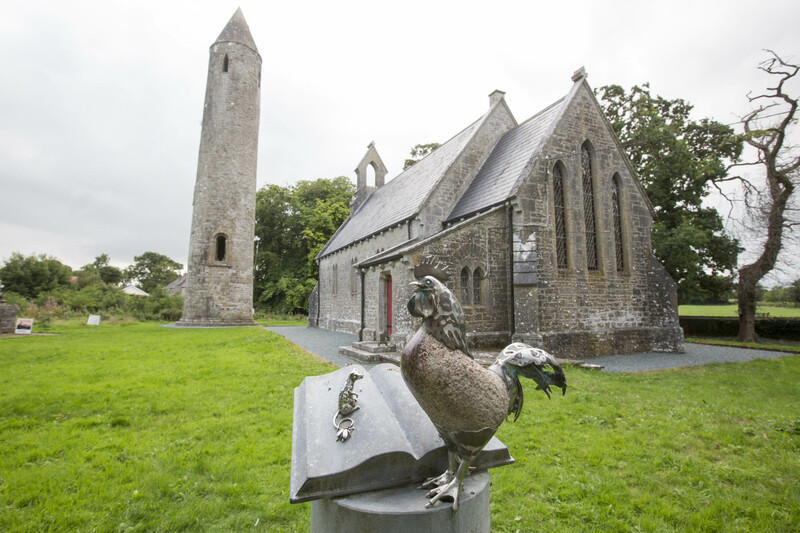 An extraordinary carved doorway makes this the most elegant round tower in Ireland. Carvings of human heads, with flowing beards and moustaches, decorate the main entrance, almost five metres from the ground. Smaller carvings decorate a second storey window. No one knows why the monks at Timahoe carved such a beautiful doorway. They may have used it to display a sacred relic to pilgrims, or the elegant decoration could reflect the monastery buildings that have disappeared from this site. The round tower was built some time in the 12th century, on the site of a religious community founded by St. Mochua around the year 600. The tower rises almost 30 metres high and is more than 20 metres wide at its base. The tower made it easy for travellers to find the monastery. Bells would be rung to call the monks to prayer, and to signal when the monastery was under attack. When the alarm sounded, monks would grab all the treasures of the monastery and scramble into the tower. Once they had drawn up the outside ladder and bolted the door, the thick stone walls kept them safe. The tower stands in a lovely setting across a footbridge that crosses the Timahoe River. Nearby, the former Church of Ireland was once used as a library and now a community-run heritage centre, with facilities for visitors. Just across from the site is a childrens’ playground. 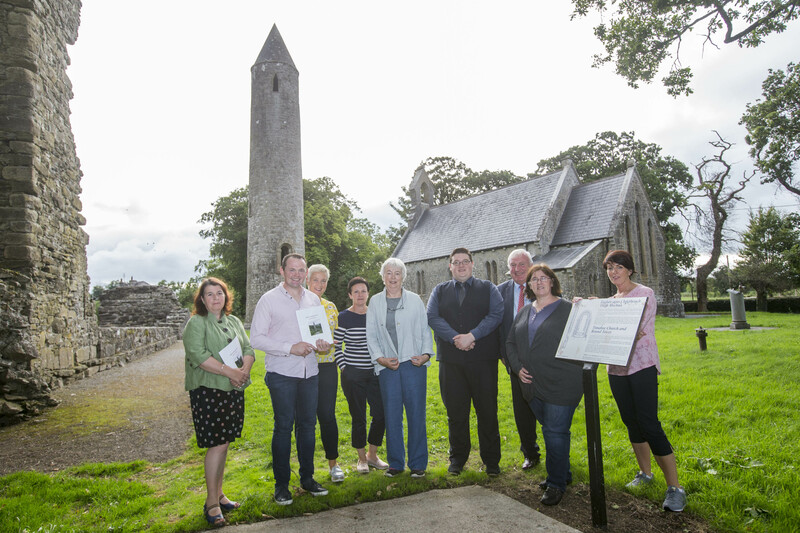 Fiona MacGowan, Ecologist; Roghan Headen, committee chairman; Mary O’Dwyer and Anne Duff, committee members; Margaret Quinlan, Conservation Architect; Tom Nelligan, Historian; Michael Parsons, Heritage Council chairman and Laois Heritage chairman; Catherine Casey, Laois Heritage Officer and committee member Catherine Duff at the launch of the Timahoe Conservation Plan in Timahoe Heritage Centre. 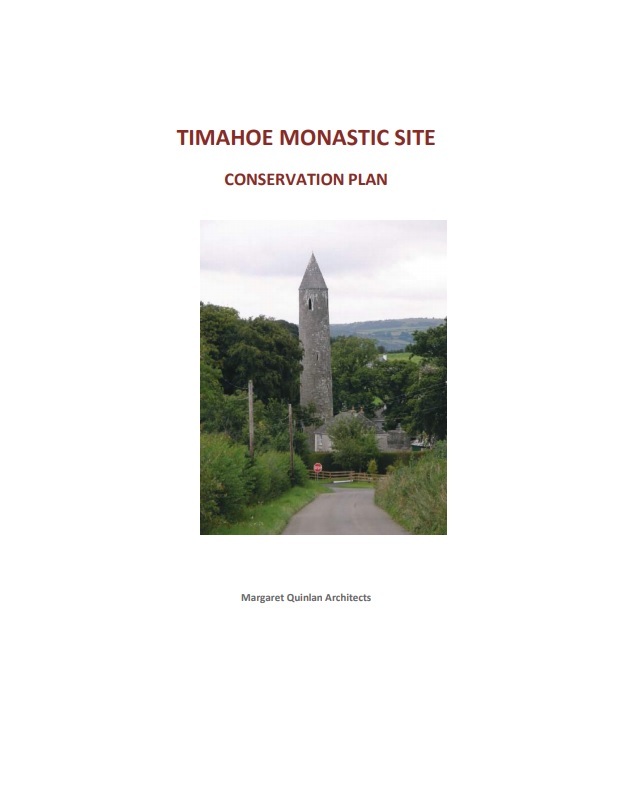 A Conservation Plan for the monastic site of Timahoe, funded by the Heritage Council and Laois County Council, was written by a team led by conservation architect Margaret Quinlan, with archaeologist Dave Pollock, ecologist Fiona MacGowan, art historian Rachel Moss, architect Aighleann O Shaughnessy and representatives of the local community. Conservation Plans are are tool for gathering together all the information on a site, assessing its heritage significance, highlighting and issues and proposing management of change into the future. The plan for Timahoe drew together all the stakeholders on the site (Local authority, community, Church of Ireland and Office of Public Works) to define how best to work together to develop, protect and present the site to visitors. The plan was published in 2018 and is available to download below. Hard copies are available to purchase at Timahoe Heritage Centre. The clip below is an introduction to a short film on the monastic sites of Laois created by Abarta Heritage for Laois County Council as part of an Ireland’s Ancient East project, funded by Fáilte Ireland. The full film can be viewed at Timahoe Heritage Centre, with narration in English, Irish, French, German, Spanish, Italian and Chinese. The Laois Monastic Trail, created as part of an Ireland’s Ancient East Project is also available in Irish, French, German, Italian, Spanish and Mandarin. The trail is also part of the Laois Heritage Smartphone App, available for iPhone and Android. A sculpture by Laois-based artist Michael Burke in the tower grounds was commissioned by the local primary school. Entitled Mochua’s Desk, it depicts St. Mochua and the three pets in a famous story about the saint: a rooster who woke him, a mouse who nibbled his ear if he fell asleep while praying, and a fly that stopped at the word Mochua stopped on when reading his prayers. Sculpture by Michael Burke at Timahoe Heritage Centre.